For those of you who want to impress your friends with big words, Cynoscion nebulosus is the proper scientific moniker. The Spotted Sea Trout is most notably known as simply the Seatrout. 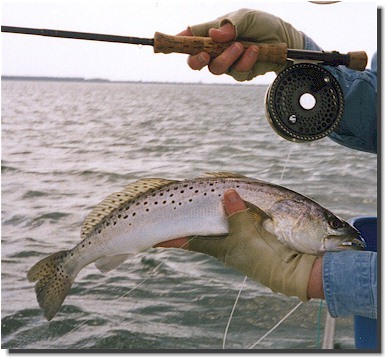 In contrast to its name, the Seatrout is NOT a trout, but a Drum. These beautiful members of the Drum family prefer salt water and can tolerate a wide range of salt content in the water. However, for reasons unknown, these babies seem to stick to relatively shallow waters where the salinity is somewhat less than that of pure seawater. They are prevalent in the southern USA from around the Virginia coast outward to Florida and on to the Gulf of Mexico. They live year round within a 30 mile radius of where they are born or hatched. A long sleek body with a blue-gray back and silver sides is the basic description of the Seatrout. Black spots are distributed along the upper portions of the body including the rearmost dorsal fin. One HUGE feature of this fish is its two large canine type teeth in the upper jaw. Yeah, they actually have teeth so watch it when you catch one because it might bite back! Spotted Sea Trout normally grow to between 1 and 5 pounds and can exist for up to 10 years. Known to be voracious predators, the Seatrout will feed on Menhaden, Anchovies, and Mullet, as well as crustaceans like Shrimp and Crabs. They actually eat ALL the time just like teenagers. Adults will form small schools and hunt for food, so feeding is an ongoing activity for them. We eat them with utensils, guys. You know; spoons, forks and knives. Seriously, this fish can be a standalone dish or added as an ingredient in other dishes. Spotted Seatrout are an excellent table fish and possess a firm white flesh that tastes like trout with the texture of whitefish. Many different preparations are possible including broiling, baking, sautéing and grilling. Smoking may be done for a different taste treat if you like. There is another fish exactly like this one called the Gray Trout. They are so close in appearance that they are commonly mistaken for each other even by professional and commercial fishermen. The telling difference is really simple. The Spotted Sea Trout has the dark spots all the way to the second dorsal fin where the Gray Trout does not. Okay, so what are you waiting for? 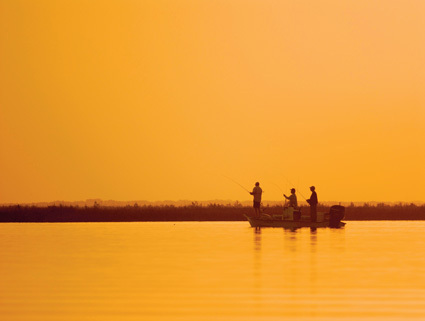 Grab your 5 weight fly rod and go get 'em! !